Durations mastered on disc (shown here) differ somewhat from durations printed on disc face (4:20 and 5:28). 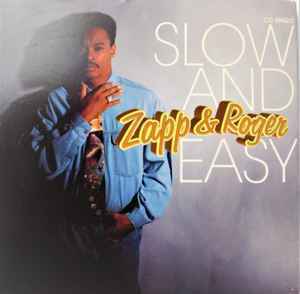 "Slow And Easy" from the Reprise Album All The Greatest Hits. Available on Cassette and Compact Disc (4/2-45143). "A Chunk Of Sugar" from the Warner Bros. album The Many Facets Of Roger. Reprise Records, a Time Warner Company, 3300 Warner Blvd., Burbank, CA 91505-4694, 75 Rockefeller Plaza, New York, NY 10019-6908. ©℗1993 Reprise Records for the U.S. and WEA International Inc. for the world outside of the U.S. ℗1981 Warner Bros. Records Inc. for the U.S. and WEA International Inc. for the world outside of the U.S. Made in U.S.A.
Reprise Records, a Time Warner Company. ℗1993 Reprise Records. ℗1981 Warner Bros. Records Inc. Mfg. by WEA Manufacturing.